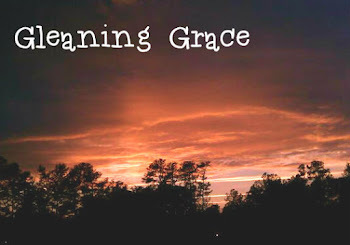 Gleaning Grace: Day 6: Crazy or Manic Monday? I sit here at 11:00 pm wondering where my day went. I'm exhausted and even though I need to be in bed, I haven't completed my Bible Study lesson for tomorrow, my read the Bible challenge passage, or this post. I've started them all, they just aren't complete. I find myself in a position to "finish in the morning" because I'm so tired. That scares me because I don't want to get behind when it's only Day 6! So much happened today that I can't even begin to journal it here tonight. Monday's are always like that I suppose - the craziest of the crazy. Perhaps even manic would be the right word. Right now, I have to give myself props for effort and praise God that it's gone this well so far. I will not give up when the going gets tough. I will start fresh tomorrow. Hopefully tomorrow will be a little LESS of the crazy.